“What do you miss most about Italy?” I asked my first Italian teacher many years ago. “La piazza,” she said so wistfully that I thought for a moment it might be someone’s name. After years of passing time in piazza, I now understand her fondness for these very special places. The piazza is an Italian’s second home, although it also can double as a shopping mall, day care center, reading room, catwalk, singles club, casino, theatre, sanctuary, office, stadium and dance floor. In the course of a day, the residents of a village or neighborhood come to the piazza to flirt, buy a newspaper, catch up on gossip, show off a new outfit, play cards, complain about the weather, talk politics or just soak in the scene. La piazza has carved a place for itself in the Italian lexicon. Someone who expresses private feelings in public puts them in piazza pubblica. People who start a loud, vulgar row fanno una piazzata. If thieves steal everything in your house, they clean the piazza (fanno piazza pulita). When a man starts to go bald, friends may tease him about andare in piazza, going to a flat open space. The piazza doesn’t discriminate. Everyone, regardless of gender, age, economics or social class, is welcome—including tourists. If you want a deeper sense of how Italians live, find a comfortable spot on a pretty piazza (not all are) and just wait. Or engage in another Italian pastime: strolling le vie di mezzo (the streets in the middle) that lead from one piazza to another. You never know what delights you may find along the way. I’ve waded through Venice’s Piazza San Marco when the “acqua alta” (high water) reached almost to my knees, visited Milan’s Piazza Affari (Italy’s Wall Street) and lingered over a limoncello in the theatrical Piazzetta di Capri. In 2000 I watched the aged and ailing Pope John Paul II celebrate the millennial Easter Mass in the grand Piazza San Pietro. Swept into a rally in Rome’s Piazza del Popolo, I felt goose bumps when a mayoral candidate addressed the throng as “Popolo di Roma! Romani!” just as countless political leaders have done through the centuries. 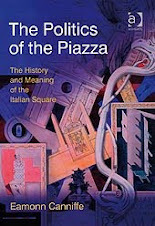 Yet I didn’t really “get” what a piazza is really all about until we were making our usual morning shopping rounds in Orbetello, a charming village set amid the lagoons of Monte Argentario in western Tuscany. The local wine merchant appeared in the piazza with a new go-cart for his four-year-old grandson. Within minutes dozens of townspeople clustered around him. Several nonni (grandfathers), laughing like school boys, took rides themselves. Others inspected and praised the spiffy three-wheeler. Passersby paused to cheer as the boy finally pedaled his way around the square. It may take a village to raise a youngster in other places, but in Italy it takes a piazza.